Legendary singer-songwriter Bob Nolan ("Tumbling Tumbleweeds," "Cool Water") with Terry Sevigny in Newhall, ca. 1948. Nolan (1908-1980) was a founding member of the Sons of the Pioneers. 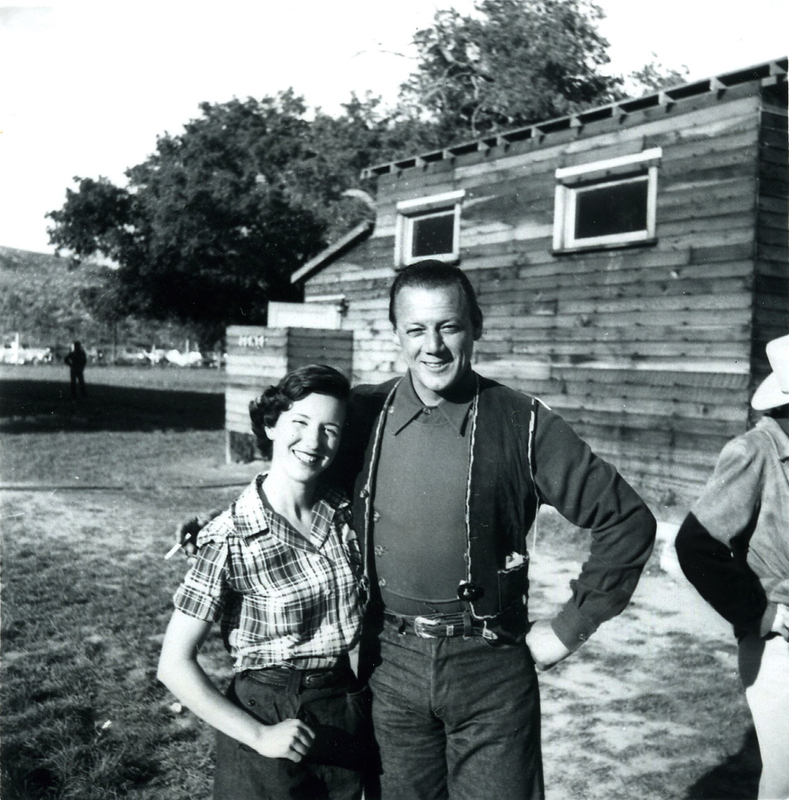 Sevigny (later married name: Theresa Scott) was the secretary for the Sons of the Pioneers from 1948-1952. Image contributed by Sevigny via the Bob Nolan tribute website, Elizabeth Drake McDonald, webmaster. According to McDonald's website, Sevingy didn't perform secretarial duties for the Sons after 1952 because, Sevigny said, "the Sons of the Pioneers had The Lucky U Ranch Show and the ad agency handled their mail." She continued to do some part-time work for Sons co-founder Tim Spencer (1908-1974). She married in 1959 and moved to Albuquerque but still kept in touch. "Whereas Tim wrote at the office (some unpublished lyrics)," Sevigny said, "none of the Sons kept files there. Hal Spencer donated a lot of Tim's memorabilia to the Western Music Association's silent auctions."